We reported on the results from a Magellan poll that showed “Undecided” was the top candidate in the Democratic gubernatorial primary. Even more interesting were the results from the Democratic primary for Colorado Attorney General. While Democrat Phil Weiser has raised nearly a million dollars, he came in at just 5% in the poll. What the hell? 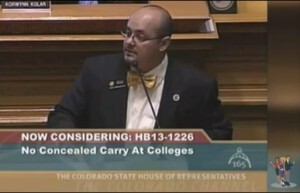 Disturbingly, State Rep. Joe Salazar, best known for his foot in mouth disease, came in at a whopping 34%. This isn’t name recognition folks, this is a ballot test – who would you vote for? In the same loser camp with Weiser are: Amy Padden (who?) also at 5% and Brad Levin at 4%. This does not bode well for Weiser. While the elite in the Democratic Party may support him (see cash haul), the average Democrat has no clue who he is. Fortunately, he has nearly one million dollars. Unfortunately, he has less than three months to boost name recognition. That’s going to require some serious spend. With Salazar in the race already at 34% and four people in the race, Salazar’s base is already gobbling up available votes. We assume that base is the Bernie folks, but will Bernie pull Salazar across the finish line? Do people know that they aren’t voting for Ken Salazar? Will Weiser have his own outside money? We assume yes. Nonetheless, it’s weird that we haven’t seen many headlines about Weiser’s current status on shaky ground. If the situation were reversed, it would be front page news everywhere. Click here for additional information on the poll.